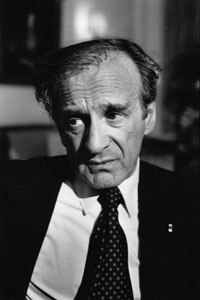 Eliezer Wiesel (/ˈɛli ˌviːˈzɛl/, Hebrew: אֱלִיעֶזֶר וִיזֶל‎ ʾĔlîʿezer Vîzel; September 30, 1928 – July 2, 2016) was a Romanian-born American Jewish writer, professor, political activist, Nobel Laureate, and Holocaust survivor. He authored 57 books, written mostly in French and English, including Night, a work based on his experiences as a prisoner in the Auschwitz and Buchenwald concentration camps. Along with writing, he was a professor of the humanities at Boston University, which created the Elie Wiesel Center for Jewish Studies in his honor. He was involved with Jewish causes and helped establish the United States Holocaust Memorial Museum in Washington, D. C. In his political activities, he also campaigned for victims of oppression in places like South Africa, Nicaragua, Kosovo, and Sudan. He publicly condemned the 1915 Armenian Genocide, and remained a strong defender of human rights during his lifetime. He was described as "the most important Jew in America" by the Los Angeles Times. Wiesel was awarded the Nobel Peace Prize in 1986, at which time the Norwegian Nobel Committee called him a "messenger to mankind", stating that through his struggle to come to terms with "his own personal experience of total humiliation and of the utter contempt for humanity shown in Hitler's death camps", as well as his "practical work in the cause of peace", Wiesel had delivered a message "of peace, atonement, and human dignity" to humanity. He was a founding board member of the New York Human Rights Foundation and remained active throughout his life. Elie Wiesel was born in Sighet (now Sighetu Marmației), Maramureș, in the Carpathian Mountains in Romania. His parents were Sarah Feig and Shlomo Wiesel. At home, Wiesel's family spoke Yiddish most of the time, but also German, Hungarian, and Romanian. Wiesel's mother, Sarah, was the daughter of Dodye Feig, a celebrated Vizhnitz Hasid and farmer from a nearby village. Dodye was active and trusted within the community. Wiesel's father, Shlomo, instilled a strong sense of humanism in his son, encouraging him to learn Hebrew and to read literature, whereas his mother encouraged him to study the Torah. Wiesel has said his father represented reason, while his mother Sarah promoted faith. Wiesel was instructed that his genealogy traced back to Rabbi Schlomo, son of Yitzhak, and was a descendant of Rabbi Yeshayahu ben Abraham Horovitz ha-Levi, an author. Wiesel had three siblings—older sisters Beatrice and Hilda, and younger sister Tzipora. Beatrice and Hilda survived the war, and were re-united with Wiesel at a French orphanage. They eventually emigrated to North America, with Beatrice moving to Montreal, Quebec, Canada. Tzipora, Shlomo, and Sarah did not survive the Holocaust. Buchenwald concentration camp, photo taken April 16, 1945, five days after liberation of the camp. Wiesel is in the second row from the bottom, seventh from the left, next to the bunk post. In March 1944, Germany occupied Hungary, which extended the Holocaust into that country. [a] Wiesel was 15, and he, with his family, along with the rest of the town's Jewish population, was placed in one of the two confinement ghettos set up in Máramarossziget (Sighet), the town where he had been born and raised. In May 1944, the Hungarian authorities, under German pressure, began to deport the Jewish community to the Auschwitz concentration camp, where up to 90 percent of the people were killed on arrival. Immediately after they were sent to Auschwitz, his mother and his younger sister were murdered. Wiesel and his father were selected to perform labor so long as they remained able-bodied, after which they were to be killed in the gas chambers. Wiesel and his father were later deported to the concentration camp at Buchenwald. Until that transfer, he admitted to Oprah Winfrey, his primary motivation for trying to survive Auschwitz was knowing that his father was still alive: "I knew that if I died, he would die." After they were taken to Buchenwald, his father died before the camp was liberated. In Night, Wiesel recalled the shame he felt when he heard his father being beaten and was unable to help. Wiesel was tattooed with inmate number "A-7713" on his left arm. The camp was liberated by the U.S. Third Army on April 11, 1945, when they were just prepared to be evacuated from Buchenwald. After World War II ended and Wiesel was freed, he joined a transport of 1,000 child survivors of Buchenwald to Ecouis, France, where the Œuvre de secours aux enfants (OSE) had set up a rehabilitation center. Wiesel subsequently joined a smaller group of 90 to 100 boys from Orthodox homes who wanted kosher facilities and a higher level of religious observance; they were cared for in a home in Ambloy under the directorship of Judith Hemmendinger. This home was subsequently moved to Taverny and operated until 1947. Afterwards, Wiesel traveled to Paris where he learned French and studied literature, philosophy and psychology at the Sorbonne. He heard lectures by philosopher Martin Buber and existentialist Jean-Paul Sartre and he spent his evenings reading works by Fyodor Dostoyevsky, Franz Kafka, and Thomas Mann. By the time he was 19, he had begun working as a journalist, writing in French, while also teaching Hebrew and working as a choirmaster. He wrote for Israeli and French newspapers, including Tsien in Kamf (in Yiddish). In 1946, after learning of the Irgun's bombing of the King David Hotel, Wiesel made an unsuccessful attempt to join the underground Zionist movement. In 1948, he translated articles from Hebrew into Yiddish for Irgun periodicals, but never became a member of the organization. In 1949 he traveled to Israel as a correspondent for the French newspaper L'arche. He then was hired as Paris correspondent for the Israeli newspaper Yedioth Ahronoth, subsequently becoming its roaming international correspondent. For ten years after the war, Wiesel refused to write about or discuss his experiences during the Holocaust. He began to reconsider his decision after a meeting with the French author François Mauriac, the 1952 Nobel Laureate in Literature who eventually became Wiesel's close friend. Mauriac was a devout Christian who had fought in the French Resistance during the war. He compared Wiesel to "Lazarus rising from the dead", and saw from Wiesel's tormented eyes, "the death of God in the soul of a child". Mauriac persuaded him to begin writing about his harrowing experiences. Wiesel first wrote the 900-page memoir Un di velt hot geshvign (And the World Remained Silent) in Yiddish, which was published in abridged form in Buenos Aires. Wiesel rewrote a shortened version of the manuscript in French, La Nuit, in 1955. It was translated into English as Night in 1960. The book sold few copies after its publication, but still attracted interest from reviewers, leading to television interviews with Wiesel and meetings with literary figures such as Saul Bellow. After its increased popularity, Night was eventually translated into 30 languages with ten million copies sold in the United States. At one point film director Orson Welles wanted to make it into a feature film, but Wiesel refused, feeling that his memoir would lose its meaning if it were told without the silences in between his words. Oprah Winfrey made it a spotlight selection for her book club in 2006. In 1955, Wiesel moved to New York as foreign correspondent for the Israel daily, Yediot Ahronot. In 1969, he married Marion Erster Rose, who was from Austria, who also translated many of his books. They had one son, Shlomo Elisha Wiesel, named after Wiesel's father. In the U.S., he went on to write over 40 books, most of them non-fiction Holocaust literature, and novels. As an author, he has been awarded a number of literary prizes and is considered among the most important in describing the Holocaust from a highly personal perspective. As a result, some historians credited Wiesel with giving the term Holocaust its present meaning, although he did not feel that the word adequately described that historical event. In 1975, he co-founded the magazine Moment with writer Leonard Fein. The 1979 book and play The Trial of God are said to have been based on his real-life Auschwitz experience of witnessing three Jews who, close to death, conduct a trial against God, under the accusation that He has been oppressive of the Jewish people. Regarding his personal beliefs, Wiesel called himself an agnostic. Wiesel also played a role in the initial success of The Painted Bird by Jerzy Kosinski by endorsing it before revelations that the book was fiction and, in the sense that it was presented as all Kosinski's true experience, a hoax. Wiesel published two volumes of memoirs. The first, All Rivers Run to the Sea, was published in 1994 and covered his life up to the year 1969. The second, titled And the Sea is Never Full and published in 1999, covered the years from 1969 to 1999. We had a champion who carried our pain, our guilt and our responsibility on his shoulders for generations. Wiesel and his wife, Marion, started the Elie Wiesel Foundation for Humanity in 1986. He served as chairman of the Presidential Commission on the Holocaust (later renamed the US Holocaust Memorial Council) from 1978 to 1986, spearheading the building of the United States Holocaust Memorial Museum in Washington, D.C. The museum gives The Elie Wiesel Award to "internationally prominent individuals whose actions have advanced the Museum's vision of a world where people confront hatred, prevent genocide, and promote human dignity". The Foundation had invested its endowment in money manager Bernard L. Madoff's investment Ponzi scheme, costing the Foundation $15 million and Wiesel and his wife much of their own personal savings. Silence encourages the tormentor, never the tormented. Sometimes we must interfere. When human lives are endangered, when human dignity is in jeopardy, national borders and sensitivities become irrelevant. He received many other prizes and honors for his work, including the Congressional Gold Medal in 1985, the Presidential Medal of Freedom, and The International Center in New York's Award of Excellence. He was also elected to the American Academy of Arts and Letters in 1996. Wiesel co-founded Moment Magazine with Leonard Fein in 1975. They founded the magazine to provide a voice for American Jews. He was also a member of the International Advisory Board of NGO Monitor. Wiesel became a popular speaker on the subject of the Holocaust. As a political activist, he also advocated for many causes, including Israel, the plight of Soviet and Ethiopian Jews, the victims of apartheid in South Africa, Argentina's Desaparecidos, Bosnian victims of genocide in the former Yugoslavia, Nicaragua's Miskito Indians, and the Kurds. In April 1999, Wiesel delivered the speech "The Perils of Indifference" in Washington D.C., criticizing the people and countries who chose to be indifferent while the Holocaust was happening. He defined indifference as being neutral between two sides, which, in this case, amounts to overlooking the victims of the Holocaust. Throughout the speech, he expressed the view that a little bit of attention, either positive or negative, is better than no attention at all. In 2003 he discovered and publicized the fact that at least 280,000 Romanian and Ukrainian Jews, along with other groups, were massacred in Romanian-run death camps. I know what people say – it is so easy. Those that were there won't agree with that statement. The statement is: it was man's inhumanity to man. NO! It was man's inhumanity to Jews! Jews were not killed because they were human beings. In the eyes of the killers they were not human beings! They were Jews! In early 2006 Wiesel accompanied Oprah Winfrey as she visited Auschwitz, a visit which was broadcast as part of The Oprah Winfrey Show. On November 30, 2006, Wiesel received a knighthood in London in recognition of his work toward raising Holocaust education in the United Kingdom. In September 2006, he appeared before the UN Security Council with actor George Clooney to call attention to the humanitarian crisis in Darfur. When Wiesel died, Clooney wrote, "We had a champion who carried our pain, our guilt, and our responsibility on his shoulders for generations." In 2007, Wiesel was awarded the Dayton Literary Peace Prize's Lifetime Achievement Award. That same year, the Elie Wiesel Foundation for Humanity issued a letter condemning Armenian genocide denial, a letter that was signed by 53 Nobel laureates including Wiesel. Wiesel has repeatedly called Turkey's 90-year-old campaign to downplay its actions during the Armenian genocide a double killing. In 2009, Wiesel criticized the Vatican for lifting the excommunication of controversial bishop Richard Williamson, a member of the Society of Saint Pius X. In June 2009, Wiesel accompanied US President Barack Obama and German Chancellor Angela Merkel as they toured Buchenwald. Wiesel was an adviser at the Gatestone Institute. In 2010, Wiesel accepted a five-year appointment as a Distinguished Presidential Fellow at Chapman University in Orange County, California. In that role, he made a one-week visit to Chapman annually to meet with students and offer his perspective on subjects ranging from Holocaust history to religion, languages, literature, law and music. In July 2009, Wiesel announced his support to the minority Tamils in Sri Lanka. He said that, "Wherever minorities are being persecuted, we must raise our voices to protest ... The Tamil people are being disenfranchised and victimized by the Sri Lanka authorities. This injustice must stop. The Tamil people must be allowed to live in peace and flourish in their homeland." In 2009, Wiesel returned to Hungary for his first visit since the Holocaust. During this visit, Wiesel participated in a conference at the Upper House Chamber of the Hungarian Parliament, met Prime Minister Gordon Bajnai and President László Sólyom, and made a speech to the approximately 10,000 participants of an anti-racist gathering held in Faith Hall. However, in 2012, he protested against "the whitewashing" of Hungary's involvement in the Holocaust, and he gave up the Great Cross award he had received from the Hungarian government. Wiesel was active in trying to prevent Iran from making nuclear weapons, stating that, "The words and actions of the leadership of Iran leave no doubt as to their intentions". He also condemned Hamas for the "use of children as human shields" during the 2014 Israel-Gaza Conflict by running an ad in several large newspapers. The Times refused to run the advertisement, saying, "The opinion being expressed is too strong, and too forcefully made, and will cause concern amongst a significant number of Times readers." Wiesel often emphasized the Jewish connection to Jerusalem, and criticized the Obama administration for pressuring Israeli Prime Minister Benjamin Netanyahu to halt East Jerusalem Israeli settlement construction. He stated that "Jerusalem is above politics. It is mentioned more than six hundred times in Scripture—and not a single time in the Koran ... It belongs to the Jewish people and is much more than a city ..."
Wiesel was particularly fond of teaching and held the position of Andrew Mellon Professor of the Humanities at Boston University since 1976, where he taught in both its religion and philosophy departments. He became a close friend of the president and chancellor John Silber. The university created the Elie Wiesel Center for Jewish Studies in his honor. From 1972 to 1976 Wiesel was a Distinguished Professor at the City University of New York and member of the American Federation of Teachers. In 1982 he served as the first Henry Luce Visiting Scholar in Humanities and Social Thought at Yale University. He also co-instructed Winter Term (January) courses at Eckerd College, St. Petersburg, Florida. From 1997 to 1999 he was Ingeborg Rennert Visiting Professor of Judaic Studies at Barnard College of Columbia University. In 1969 he married Marion Erster Rose, who originally was from Austria and also translated many of his books. They had one son, Shlomo Elisha Wiesel, named after Wiesel's father. The family lived in Greenwich, Connecticut. Wiesel was attacked in a San Francisco hotel by 22-year-old Holocaust denier Eric Hunt in February 2007, but was not injured. Hunt was arrested the following month and charged with multiple offenses. In February 2012, a member of The Church of Jesus Christ of Latter-day Saints performed a posthumous baptism for Simon Wiesenthal's parents without proper authorization. After his own name was submitted for proxy baptism, Wiesel spoke out against the unauthorized practice of posthumously baptizing Jews and asked presidential candidate and Latter-day Saint Mitt Romney to denounce it. Romney's campaign declined to comment, directing such questions to church officials. Utah senator Orrin Hatch paid tribute to Wiesel in a speech on the Senate floor the following week, where he said that, "With Elie's passing, we have lost a beacon of humanity and hope. We have lost a hero of human rights and a luminary of Holocaust literature." In 2018, antisemitic graffiti was found on the house where Wiesel was born. Prix de l'Université de la Langue Française (Prix Rivarol) for The Town Beyond the Wall, 1963. National Jewish Book Council Award for The Town Beyond the Wall, 1963. Prix Médicis for A Beggar in Jerusalem, 1968. Jewish Heritage Award, Haifa University, 1975. Holocaust Memorial Award, New York Society of Clinical Psychologists, 1975. Jabotinsky Medal, State of Israel, 1980. Prix Livre Inter, France, for The Testament, 1980. Grand Prize in Literature from the City of Paris for The Fifth Son, 1983. Commander in the French Legion of Honor, 1984. U.S. Congressional Gold Medal, 1984. Four Freedom Award for the Freedom of Worship, 1985. Grand Officer in the French Legion of Honor, 1990. Niebuhr Medal, Elmhurst College, Illinois, 1995. Grand Cross in the French Legion of Honor, 2000. Order of the Star of Romania, 2002. Man of the Year award, Tel Aviv Museum of Art, 2005. Light of Truth award, International Campaign for Tibet, 2005. Honorary Knighthood, United Kingdom, 2006. Honorary Visiting Professor of Humanities, Rochester College, 2008. Norman Mailer Prize, Lifetime Achievement, 2011. Loebenberg Humanitarian Award, Florida Holocaust Museum, 2012. S. Roger Horchow Award for Greatest Public Service by a Private Citizen, an award given out annually by Jefferson Awards, 2013. John Jay Medal for Justice John Jay College, 2014. Wiesel had received more than 90 honorary degrees from colleges worldwide. Doctor of Humane Letters, Lehigh University, Bethlehem, Pennsylvania, 1985. Doctor of Humane Letters, DePaul University, Chicago, Illinois, 1997. Doctorate, Seton Hall University, New Jersey, 1998. Doctor of Humanities, Michigan State University, 1999. Doctorate, McDaniel College, Westminster, Maryland, 2005. Doctor of Humane Letters, Chapman University, 2005. Doctor of Humane Letters, Dartmouth College, 2006. Doctor of Humane Letters, Cabrini College, Radnor, Pennsylvania, 2007. Doctor of Humane Letters, University of Vermont, 2007. Doctor of Humanities, Oakland University, Rochester, Michigan, 2007. Doctor of Letters, City College of New York, 2008. Doctorate, Tel Aviv University, 2008. Doctorate, Weizmann Institute, Rehovot, Israel, 2008. Doctor of Humane Letters, Bucknell University, Lewisburg, Pennsylvania, 2009. Doctor of Letters, Lehigh University, Bethlehem, Pennsylvania, 2010. Doctor of Humane Letters, Washington University in St. Louis, 2011. Doctor of Humane Letters, College of Charleston, 2011. Doctorate, University of Warsaw, June 25, 2012. Doctorate, The University of British Columbia, September 10, 2012. ^ In 1940, after the Second Vienna Award, the town of Sighet (Máramarossziget) was returned to Hungary. ^ "NLS Other Writings: Say How, U-X". National Library Service for the Blind and Physically Handicapped (NLS) - Library of Congress. ^ "Winfrey selects Wiesel's 'Night' for book club". Associated Press. January 16, 2006. Retrieved May 17, 2011. ^ "The Nobel Peace Prize for 1986: Elie Wiesel". Nobelprize.org. October 14, 1986. Archived from the original on July 6, 2008. Retrieved May 17, 2011. ^ "Elie Wiesl". Human Rights Foundation. Archived from the original on January 18, 2017. Retrieved July 3, 2016. ^ "Human Rights Foundation Lauds OAS Discussion on Venezuela". Latin American Herald Tribune. Retrieved July 3, 2016. ^ Liukkonen, Petri. "Elie Wiesel". Books and Writers (kirjasto.sci.fi). Finland: Kuusankoski Public Library. Archived from the original on January 7, 2010. ^ "The Life and Work of Wiesel". Public Broadcasting Service. 2002. Retrieved August 15, 2010. ^ "Elie Wiesel Biography". Academy of Achievement. October 22, 2010. Archived from the original on October 5, 2010. Retrieved August 15, 2010. ^ Wiesel, Elie, and Elie Wiesel Catherine Temerson (Translator). "Rashi (Jewish Encounters)." 9780805242546. Schocken, 01 Jan. 1970. Web. 27 Oct. 2016. ^ "Elie Wiesel — Photograph". United States Holocaust Memorial Museum. Archived from the original on July 19, 2013. ^ "Night by Elie Wiesel". Aazae. ^ Donadio, Rachel (January 20, 2008). "The Story of 'Night'". The New York Times. Retrieved May 17, 2011. ^ "Eliezer Wiesel, 1986: Not caring is the worst evil" (PDF). Nobel Peace Laureates. ^ Kanfer, Stefan (June 24, 2001). "Author, Teacher, Witness". TIME. Retrieved May 17, 2011. ^ Niven, William John (2007). The Buchenwald Child: Truth, Fiction, and Propaganda. Harvard University Press. p. 49. ISBN 1571133399. ^ Schmidt, Shira, and Mantaka, Bracha. "A Prince in a Castle". Ami, September 21, 2014, pp. 136-143. ^ Sternlicht, Sanford V. (2003). Student Companion to Elie Wiesel. Westport, Conn.: Greenwood Press. p. 7. ISBN 0-313-32530-8. ^ Elie Wiesel: Conversations. Elie Wiesel, Robert Franciosi. "Elie Wiesel: Conversations". University Press of Mississippi, 2002. p. 81. "Interviewer: Why after the war did you not go on to Palestine from France? Wiesel: I had no certificate. In 1946 when the Irgun blew up the King David Hotel, I decided I would like to join the underground. Very naively I went to the Jewish Agency in Paris. I got no further than the janitor who asked: "What do you want?" I said, "I would like to join the underground." He threw me out. About 1948 I was a journalist and helped one of the Yiddish underground papers with articles, but I was never a member of the underground." ^ a b c d e f g "Elie Wiesel". JewishVirtualLibrary.org. ^ Naomi Seidman (Fall 1996). "Elie Wiesel and the Scandal of Jewish Rage". Jewish Social Studies. 3:1: 5. ^ Andrew Grabois (February 25, 2008). "Elie Wiesel and the Holocaust". Beneath The Cover. Archived from the original on April 30, 2008. Retrieved August 29, 2012. ^ Ravitz, Jessica (May 27, 2006). "Utah Local News – Salt Lake City News, Sports, Archive – The Salt Lake Tribune". Sltrib.com. Archived from the original on November 3, 2013. Retrieved May 14, 2013. ^ a b Telushkin, Joseph. "Rebbe", pp. 190–191. HarperCollins, 2014. ^ Wiesel, Elie (2000). And the Sea Is Never Full: Memoirs, 1969–. Random House Digital, Inc. ISBN 978-0-8052-1029-3. Some of the questions: God? 'I'm an agnostic.' A strange agnostic, fascinated by mysticism. ^ "The Painted Bird [NOOK Book]". Barnes and Noble. Retrieved September 9, 2014. ^ Finkelstein, Norman G. The Holocaust Industry. Verso. p. 56. ^ "President Clinton's and Elie Wiesel's Remarks on Bosnia Troops". United States Holocaust Memorial Museum. December 13, 1995. Retrieved July 2, 2016. ^ a b Berger, Joseph (July 2, 2016). "Elie Wiesel, Auschwitz Survivor and Nobel Peace Prize Winner, Dies at 87". The New York Times. ISSN 0362-4331. Retrieved July 2, 2016. ^ Strom, Stephanie (February 26, 2009). "Out Millions, Elie Wiesel Vents About Madoff" – via NYTimes.com. ^ "The Nobel Peace Prize 1986". NobelPrize.org. ^ "American Academy of Arts and Letters - Current Members". Archived from the original on June 24, 2016. Retrieved July 3, 2016. ^ "About – Moment Magazine". Moment Magazine. Retrieved June 22, 2016. ^ "International Advisory Board Profiles: Elie Wiesel". NGO Monitor. 2011. Retrieved May 17, 2011. ^ Eidenmuller, Michael E. "American Rhetoric: Elie Wiesel - The Perils of Indifference". americanrhetoric.com. Retrieved 2017-11-27. ^ "Echoes & Reflections: Speech by Elie Wiesel - Education & E-Learning - Yad Vashem". Retrieved 2018-04-17. ^ "Oprah and Elie Wiesel Travel to Auschwitz". oprah.com. January 1, 2006. Retrieved May 17, 2011. ^ a b Cohen, Justin (November 30, 2006). "Wiesel Receives Honorary Knighthood". TotallyJewish.com. Archived from the original on June 6, 2011. Retrieved May 17, 2011. ^ McAllister, Kristin (October 15, 2007). "Dayton awards 2007 peace prizes". Dayton Daily News. Retrieved May 17, 2011. ^ Holthouse, David (Summer 2008). "State of Denial: Turkey Spends Millions to Cover Up Armenian Genocide". Southern Poverty Law Center. Archived from the original on January 20, 2010. Retrieved May 17, 2011. ^ Pullella, Philip (January 28, 2009). "Elie Wiesel attacks pope over Holocaust bishop". Reuters. Retrieved May 17, 2011. ^ "Visiting Buchenwald, Obama speaks of the lessons of evil". CNN. June 5, 2009. Retrieved May 17, 2011. ^ "Paid Notice: Deaths WIESEL, ELIE". query.nytimes.com. Retrieved 2019-03-18. ^ Sahagun, Louis. "Wiesel offers students first-hand account of Holocaust". Los Angeles Times. Retrieved January 28, 2014. ^ "The Elie Wiesel Foundation for Humanity". www.eliewieselfoundation.org. Archived from the original on 2009-07-04. Retrieved 2016-07-03. ^ "Sri Lanka's victimization of Tamil people must stop - Elie Wiesel". Retrieved July 3, 2016. ^ "Sri Lanka's victimization of Tamil people must stop - Elie Wiesel". www.tamilguardian.com. Retrieved 2016-07-03. ^ Quatra.Net Kft. (November 10, 2009). "Elie Wiesel Magyarországon" (in Hungarian). Stop.hu. Archived from the original on July 21, 2011. Retrieved September 13, 2010. ^ "Magyarországra jön Elie Wiesel" (in Hungarian). Hetek.hu. November 13, 2009. Retrieved September 13, 2010. ^ Patai, Raphael (1996). The Jews of Hungary:History, Culture, Psychology. 590: Wayne State University Press. p. 730. ISBN 0-8143-2561-0. ^ Reuters. Wiesel raps Hungary's Nazi past 'whitewash'. The Jerusalem Post. June 19, 2012. ^ "Elie Wiesel Says "Iran Must Not Be Allowed to Remain Nuclear" in Full-Page Ads in NYT, WSJ". Algemeiner Journal. December 18, 2013. Retrieved June 30, 2015. ^ Almasy, Steve; Levs, Josh (August 3, 2014). "Nobel laureate Wiesel: Hamas must stop using children as human shields". CNN. Retrieved August 13, 2014. ^ "London Times refuses to run Elie Wiesel ad denouncing Hamas' human shields". Haaretz. JTA. August 6, 2014. Retrieved August 13, 2014. ^ Greenslade, Roy (August 8, 2014). "The Times refuses to carry ad accusing Hamas of 'child sacrifice'". The Guardian. Retrieved August 13, 2014. ^ Cooper, Helene (May 4, 2010). "Obama Tries to Mend Fences With American Jews". New York Times. ^ "Elie Wiesel: Jerusalem is Above Politics (ad also placed in 3 newspapers on April 16)". Arutz Sheva. April 17, 2010. Retrieved May 17, 2011. ^ "For Jerusalem". The Elie Wiesel Foundation for Humanity. Archived from the original on August 15, 2015. Retrieved May 17, 2011. ^ "Illustrious Friends Remember John R. Silber". The Alcalde. Retrieved February 20, 2013. ^ "Wiesel to Speak at Barnard; Lectures Help Launch a $2.5M Judaic Studies Chair. Columbia University Record, November 21, 1997". Columbia.edu. November 21, 1997. Retrieved July 24, 2013. ^ "Human rights advocate Elie Wiesel turns 86". Retrieved July 3, 2016. ^ "Police arrest man accused of attacking Wiesel: Holocaust-surviving Nobel laureate was allegedly accosted in elevator". MSNBC. Associated Press. February 18, 2007. Retrieved May 17, 2011. ^ "Man gets two-year sentence for accosting Elie Wiesel". USA Today. Associated Press. August 18, 2008. Retrieved August 27, 2008. ^ Fletcher Stack, Peggy (February 13, 2012). "Mormon church apologizes for baptisms of Wiesenthal's parents". The Salt Lake Tribune. Salt Lake City, Utah. ^ "Elie Wiesel calls on Mitt Romney to make Mormon church stop proxy baptisms of Jews". The Washington Post. February 14, 2012. Retrieved July 3, 2016. ^ Yuhas, Alan (July 2, 2016). "Elie Wiesel, Nobel winner and Holocaust survivor, dies aged 87". The Guardian. Retrieved July 2, 2016. ^ Shnidman, Ronen (July 2, 2016). "Elie Wiesel, Nobel Peace Prize laureate and renowned Holocaust survivor, dies at 87". Haaretz. ^ "Anti-semitic graffiti on Auschwitz survivor Elie Wiesel's house - BBC News". Bbc.com. 2018-08-04. Retrieved 2018-08-05. ^ a b c d e f Davis, Colin (1994). Elie Wiesel's Secretive Texts. Gainesville, FL: University Press of Florida. ISBN 0-8130-1303-8. ^ a b c d e f g h "Elie Wiesel Timeline and World Events: From 1952". Holocaust Encyclopedia. United States Holocaust Memorial Museum. Retrieved February 4, 2012. ^ "Rooseveltinstitute.org". Archived from the original on March 25, 2015. ^ "The Niebuhr Legacy: Elie Wiesel". Elmhurst College. Archived from the original on February 5, 2012. Retrieved February 5, 2012. ^ "Holocaust survivor honored". Christian Chronicle. Archived from the original on October 3, 2008. ^ "Winners of the National Humanities Medal and the Charles Frankel Prize". Web.archive.org. July 21, 2011. Archived from the original on July 21, 2011. Retrieved February 20, 2013. ^ "To Life: Celebrating 20 Years". Florida Holocaust Museum. Archived from the original on February 7, 2012. ^ "Elie Wiesel receives 2012 Nadav Award. Ynetnews. November 11, 2012". Ynetnews.com. Retrieved February 20, 2013. ^ "National Winners – public service awards – Jefferson Awards.org". Retrieved October 6, 2014. ^ "John Jay Justice Award 2014". cuny.edu. ^ "Honorary Degrees Going To 6 At Lehigh". The Morning Call. May 15, 1985. Retrieved February 3, 2012. ^ "Presidents, premiers and peacemakers merit honorary degrees". DePaul University. Retrieved February 5, 2012. ^ "Honorary Degree Recipients". Seton Hall University. April 17, 2005. Retrieved February 5, 2012. ^ "Results - Howard Gotlieb Archival Research Center". Retrieved July 3, 2016. ^ "Convocation set tomorrow to honor Elie Wiesel". Baltimore Sun. Retrieved February 5, 2012. ^ Coker, Matt. "Elie Wiesel Joins Chapman University, to Guide Undergrads Spring Semesters Through 2015". OC Weekly. Archived from the original on November 3, 2013. Retrieved January 28, 2014. ^ "Elie Wiesel to Speak at Commencement". Vox of Dartmouth. Dartmouth College. May 15, 2006. ^ "Message from the President". Cabrini Magazine. Pennsylvania: Cabrini College. 4 (2): 2. February 22, 2007. ^ "Elie Wiesel to Speak At UVM April 25, Receive Honorary Degree". University of Vermont. April 24, 2007. Retrieved February 5, 2012. ^ "OU to award Elie Wiesel honorary degree during lecture". Oakland University. October 2, 2007. Archived from the original on April 7, 2014. Retrieved February 5, 2012. ^ "ELIE WIESEL TO DELIVER INAUGURAL PRESIDENT'S LECTURE AT THE CITY COLLEGE OF NEW YORK". City College of New York. March 25, 2008. Retrieved February 5, 2012. ^ "Elie Wiesel and Martin J. Whitman Among Notable American Recipients of TAU's Highest Honor". American Friends of Tel Aviv University. May 20, 2008. Retrieved February 5, 2012. ^ "Honorary Doctorates of the Weizmann Institute of Science". Archived from the original on January 25, 2012. Retrieved February 4, 2012. ^ "Honorary Degrees" (PDF). Bucknell University. Archived from the original (PDF) on August 2, 2012. Retrieved February 5, 2012. ^ "2010 honorary degree recipients announced". Lehigh University. March 26, 2010. Retrieved February 3, 2012. ^ "Holocaust survivor, human rights activist Wiesel to deliver Commencement address". Washington University in St. Louis. April 5, 2011. Retrieved February 5, 2012. ^ "Professor Elie Wiesel awarded the University of Warsaw Honorary Doctorate". University of Warsaw. 2012. Archived from the original on July 16, 2012. Retrieved July 6, 2012. ^ "Nobel laureate Elie Wiesel receives UBC honorary degree". University of British Columbia. 2012. Retrieved September 10, 2012. Burger, Ariel (2018). Witness: Lessons from Elie Wiesel's Classroom. Houghton Mifflin Harcourt. ISBN 978-1328802699. Chighel, Michael (2015). "Hosanna! Eliezer Wiesel's Correspondence with the Lubavitcher Rebbe" (online book). Cockburn, Alexander (April 1, 2006). "Did Oprah Pick Another Fibber? : Truth and Fiction in Elie Wiesel's Night: Is Frey or Wiesel the Bigger Moral Poseur?". CounterPunch. Retrieved February 2, 2012. Doblmeier, Martin (2008). The Power of Forgiveness (Documentary). Alexandria, VA: Journey Films. Archived from the original on 2008-09-08. Friedman, John S. (Spring 1984). "Elie Wiesel, The Art of Fiction No. 79". The Paris Review. Hitchens, Christopher (February 1, 2001). "Wiesel Words". The Nation. Retrieved February 3, 2012. Rota, Olivier. Choisir le français pour exprimer l'indicible. Elie Wiesel, in Mythe et mondialisation. L'exil dans les littératures francophones, Actes du colloque organisé dans le cadre du projet bilatéral franco-roumain « Mythes et stratégies de la francophonie en Europe, en Roumanie et dans les Balkans », programme Brâcuşi des 8–9 septembre 2005, Editura Universităţii Suceava, 2006, pp. 47–55. Re-published in Sens, dec. 2007, pp. 659–668. "Facing Hate with Elie Wiesel". Bill Moyers. November 27, 1991. "Perils of Indifference" Speech by Elie Wiesel, Washington, D.C., Transcript (as delivered), Audio, Video, April 12, 1999. "Perils of Indifference" Speech by Elie Wiesel, Washington, D.C., Text and Audio, April 12, 1999. The Kennedy Center Presents: Speak Truth to Power: Elie Wiesel, PBS, October 8, 2000. Elie Wiesel: First Person Singular, PBS, October 24, 2002. Diamante, Jeff (July 29, 2006), "Elie Wiesel on his beliefs", The Star, Toronto, archived from the original on June 2, 2008 . Voices on Antisemitism Interview with Elie Wiesel from the United States Holocaust Memorial Museum, May 24, 2007. "'We must not forget the Holocaust'". Today (BBC Radio 4). September 15, 2008. BBC. BBC Radio 4. "A conversation with Elie Wiesel". Charlie Rose. June 8, 2009. PBS. Archived from the original on June 13, 2009. "Unmasking Evil – Elie Wiesel, featuring Soledad O'Brien, 2009". Oslo Freedom Forum 2009. 2010. Oslo Freedom Forum. "Elie Wiesel on the Leon Charney Report (Segment)". The Charney Report. 2006. WNYE-TV. "Elie Wiesel on the Leon Charney Report". The Charney Report. 2006. WNYE-TV. Wikimedia Commons has media related to Elie Wiesel. Elie Wiesel, Nobel Luminaries - Jewish Nobel Prize Winners, on the Beit Hatfutsot-The Museum of the Jewish People Website.